Hebraist and rabbi of Peiskretscham, Upper Silesia; born Dec. 6, 1805; died Feb. 14, 1860. He left a large number of manuscripts—several hundred sermons in Hebrew and German, novellæ on the Talmud, verses, a German work on Hebrew grammar, and a work entitled "Ḳorot Tannaim wa-Amoraim," a history of the Tannaim and Amoraim, the introduction to which, entitled "Parnasat Ḥakme ha-Talmud," was published in Kobak's "Jeschurun" (i., part 3, p. 81). His published works are: "Meḳore Minhagim" (Berlin, 1846), a critical essay on religious customs according to the Talmud, Poseḳim, and Midrashim (this work was afterward plagiarized by Finkelstein, Vienna, 1851); "Shete Derashot" (Gleiwitz, 1856), sermons; "Toledot R. Yehoshua' ben Ḥananyah," biography of R. Joshua b. Hananiah (in Keller's "Bikkurim," 1865); "Toledot Rab," biography of Rab or Abba Arika (Kobak's "Jeschurun," vi. and vii.). 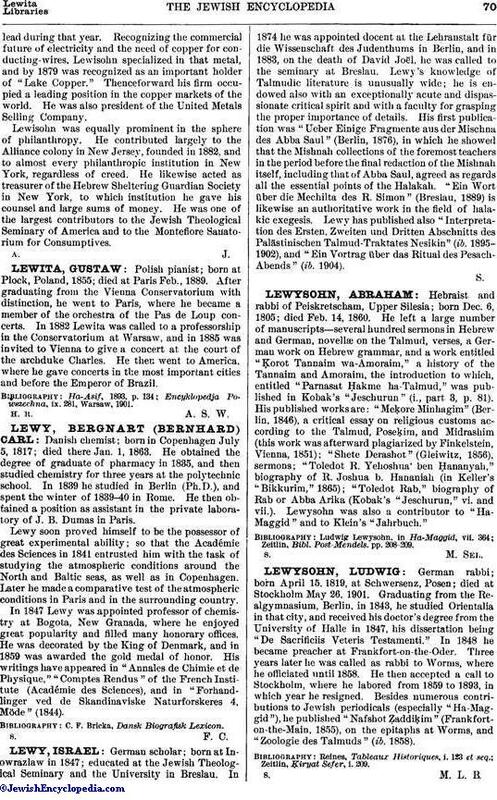 Lewysohn was also a contributor to "Ha-Maggid" and to Klein's "Jahrbuch." Zeitlin, Bibl. Post-Mendels, pp. 208-209.